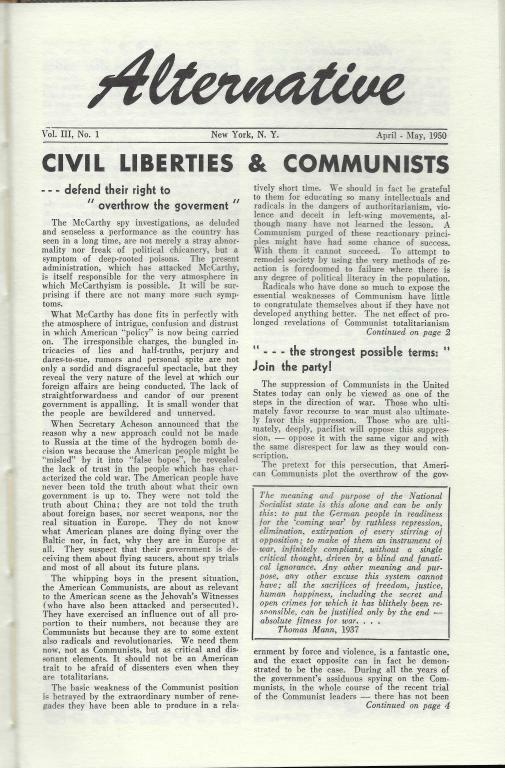 Archive of Alternative, an anarchist publication produced out of New York City from 1948-1951 and focusing on pacifist viewpoints. Interesting, have not seen this before. Ralph DiGia was a stalwart at the War Resisters League (WRL), "Peace Pentagon", 339 Lafayette St (where WSA had an office). Ralph was a nice guy. Such a tragedy that one of their children "disappeared". I don't think anyone knows whatever happened. Anyway, Ralph was, a WWII CO draft resister. He remained an anarcho-pacifist for many, many decades. We all had mucho respect for him. Mr. DiGia grew up on the Upper West Side, the son of an immigrant barber. In 1927, when Mr. DiGia was 12, his father took him to a rally protesting the imminent execution of Nicola Sacco and Bartolomeo Vanzetti, whose murder trial centered on their radical political beliefs. ''My first demonstration,'' Mr. DiGia said, smiling. In 1941, Mr. DiGia received his draft notice, but reported instead to the United States attorney's office to announce that he was a conscientious objector. After being convicted of failure to report for induction in 1943, he was sent to a federal penitentiary in Danbury, Conn., where he helped lead a successful effort to integrate the prison dining hall. Yep, another publication I happened to stumble upon. Have the entire run, which was reprinted by Greenwood. Some of the people behind Alternative came from Why? and Retort. Yes, I can see that, for sure. I was surprised to see Ralph's name, but, then again, I shouldn't be. Like I said, didn't know about this one and glad you found it. Pleased to say that this is finished. It is the full run besides Vol. 3, No. 3 & 4, which were confiscated and destroyed by postal authorities.